At age 13, Alex Santilli went from building Legos to assembling computers. At 16 he began designing custom speakers. By 19 he was mixing on Pro Tools, and had begun restoring ‘dead’ analog consoles. In 2009 a local Philadelphia studio owner hired him to ‘resurrect’ expired gear. Before long, Santilli had restored his console and outboard gear, rewired the entire studio, and was engineering sessions. Eventually he was named studio manager. Two years later he was ready to build his own recently completed Spice House Studio. 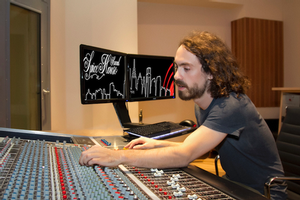 Santilli has a genuine reverence for audio, and a reputation as an innate ‘gear whisperer.’ A ‘hands-on prodigy’ he personally implemented the entire systems integration, for his Philadelphia-based Spice House Sound Studios.